BODENEHR - Der Neuen Welt .. Nord America und Sud America..
BODENEHR, G. - Der Neuen Welt .. Nord America und Sud America..
Der Neuen Welt .. Nord America und Sud America.. - BODENEHR, G.
Size : 5.8 x 10.5 inches. / 14.7 x 26.7 cm. 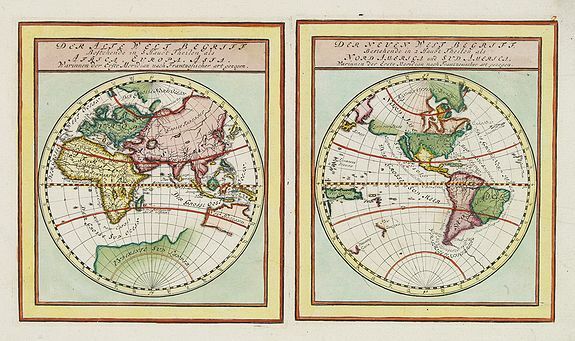 Description :Two maps on one sheet, showing eastern and western hemisphere. California as an island. To the left a map of Europe, Africa, Asia and Australia.